Magnificent is a western worth watching and if you pass on this, you will surely regret it. The only change I wish they would of had is more backstory on each of the seven members who include: Chisolm (Denzel Washington), Josh Faraday (Chris Pratt), Goodnight Robicheaux (Ethan Hawk), Jack Horne (Vincent D'Onofrio), Billy Rocks (Byung- Hun Lee), Red Harvest (Martin Sensmeier) and Vasquez (Manuel Garcia-Rulfo). Sure they get them all together just fine, but I would have liked more of a story for each, even if it would have made the movie longer. 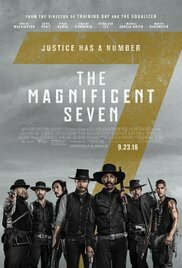 Magnificent 7 is a story about vengeance towards the villain of the story Bartheolomew Bogue (Peter Sarsgaard) who has taken over a town. One damsel by the name of Emma Cullen (Haley Bennett) looks for help and she sure found the warriors to do it. Again, if you like westerns, this is not one to miss.